Five state park hikes you’ll want to brag about. 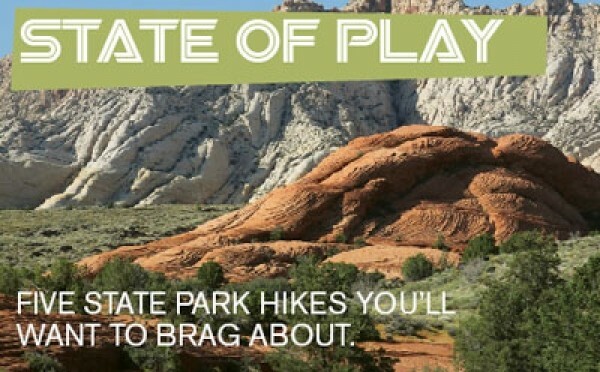 Utah’s national parks boast some of the nation’s greatest hiking trails. They’re scenic, awe-inspiring and feature rare rock formations—but they’re also ridiculously crowded. For hikers looking to enjoy Utah’s great landscapes without rubbing elbows with noisy East Coast tourists, venturing to Utah’s state parks is a must. These locales are just as majestic as many of the national parks, but are far more secluded. Below are five of the best trails the state parks have to offer. If you have just a few hours to kill and want to get the most out of a visit to Snow Canyon, Three Ponds is the way to go. It intersects with four other trails and paths in the canyon, giving hikers the opportunity for short detours. The path isn’t steep, but it features everything from slickrock to deep sand. Be sure to go all the way to the end of the trail—400-foot canyon walls and three sandstone pools filled with spring runoff await. Like many of the hikes in Utah state parks, those in Fremont Indian State Park are quite short, but you can link them together via the Centennial Loop Trail, which meanders 5.2 miles through some of the park’s best attractions. Along the loop, you’ll come across well-known Indian rock-art sites such as the 100 Hands Cave and the Arch of Art. If you can ignore the noise from Interstate 70, which runs parallel to the trail, you’ll enjoy this archaeologically rich hike. Starting at the Goblin Valley picnic area, Entrada Canyon is a quick and easy jaunt that ends at the famed goblin amphitheater the park is known for. While you won’t be squeezing through any slot canyons, Entrada Canyon is scenic enough to keep the hike entertaining before you hit the moonscape-like amphitheater. Along the way, be sure to stay on the trail—the surrounding ground is covered with cryptobiotic soil, a living ground cover consisting of lichen, moss, bacteria and other organisms. This loop, beginning in White Rock Bay, gives hikers great panoramic views of Antelope Island’s gentle hills and bison. The trail begins on the west side of the island, then follows a consistent pitch toward Elephant Head and Beacon Knob. White Rock itself is a good hike, but hit some of the accompanying side trails for a more varied experience. For the best workout, catch the Split Rock loop for some steep switchbacks, or go to Elephant Head before jumping back on the rolling White Rock circuit. This park west of Heber is best known for mountain biking, but its more technical terrain makes for great hiking as well. Enchanted Forest and 1000 Turns are part of the Dutch Hollow trail system, which is made up of more than 20 miles of interconnected trails above Midway. Starting at 1000 Turns, hikers enjoy a steady ascent before hitting a switchback-heavy section that connects to Enchanted Forest. On the way, enjoy the Gambel oak and conifer patches with views of Heber Valley and, occasionally, Mount Timpanogos.